The Finwing Finwing 3Kg Sub-Micro Metal Gear Servo, is designed for use for the elevator function on the Finwing Air Titan air frame. This single servo provides upto 3.0Kg's of torque at 6.0v giving ample power for it's intending purpose on this air frame, with an AUW of around 7.0Kg's. This servo comes with a variety of plastic arms to suit different applications, as we also recommend using this servo with the Finwing 390 Degree Pan & Tilt Mechanism, as an alternative upgrade to the standard Finwing 17g Servo FUS017 (Plastic Geared). Also supplied with the servo are screws for attaching the servo arms and mounting, as well as the necessary mounting hardware. 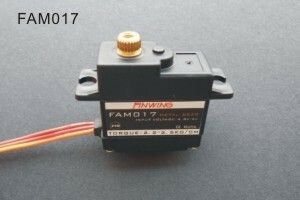 This is a very powerful servo for it's size which is 28mm x 12mm x 29mm, the same size as the standard Finwing 17g Plastic Geared Servo. Again like all Finwing servo's, come supplied with a JR/Spektrum style 3-pin plug (no tab), which will also fit Futaba, FrSky, and most other well known manufacturers radio's.